Esau Fitzpatrick is bad at being good—and even worse at being bad. As he waits for his sweetheart, Ella Allen, inside the Paisley Settlement church, a brewing storm erupts and lightning strikes, setting the church aflame. Ella and her parents pull Esau from the fire, but his parents are lost in the blazing inferno. Angry at God, Esau flees his home and all he holds dear, only to fall in with the notorious Covington-Jones gang. He journeys down the path to destruction and darkness, reliving the hellish fire in his nightmares. Ella clings to the prayer that Esau will find his way back to a godly path – and to her. But Esau is gone, and her world is falling to pieces. Ella must lean on God in a way she’s never had to before as she follows her heart against everyone’s wishes. Can she dare to believe that Esau will ever change? Esau’s life as an outlaw comes to a head during an epic cattle rustle. He is forced to choose between eternal hellfire and the rocky path of the Lord. Will Ella still be waiting for him? Or has he lost her forever? God reaches out to Esau again, but will it be in time? The blistering heat from the angry flames licked skyward from the sodbuster’s cabin and seemed to singe the unkempt whiskers on Esau’s face. Hot as hell’s fire. Beads of moisture cropped up on his neck. Unsure if it was the unforgiving heat, the muggy Texas night, or the thought of hell’s eternal inferno that broke him out in such a sudden sweat, he shivered. 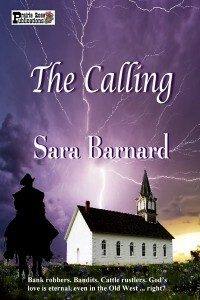 Esau’s greasy black locks poked out from beneath his black felt hat, tickling just inside the collar of his duster. He slapped at his itchy neck. It had been weeks since the Covington-Jones Gang had been through anything resembling a town, and the result was that the lot of them were sorely in need of haircuts. Esau included. His mount, the stolen nag with the Rockin’ R brand, huffed heavily in the smoky air. Her sides heaved and her head dipped low. Tristan Jones turned in the saddle, his thin lips curled into a sneer. “Sounds like that horse ain’t well.” The gang leader’s laugh was sadistic. “Might have you shoot ’er just to prove your salt, greenhorn!” The irony of the red-head’s fiery temper matching the events of the evening wasn’t lost on Esau. Esau’s stomach churned. Sure, since taking up with the Covington-Jones gang, they’d pulled some harebrained stunts, but there hadn’t been any bloodshed. Yet. Pushing the uneasiness down deep in his gut, Esau gazed at the blazing homestead and tried to ignore Tristan’s cackling laugh. As he stared at the inferno, the image of the church he’d attended as a boy flashed before his eyes. For a moment, he could hear his mother’s cries all over again. He shook his head. Thunder rumbled in the distance. A burst of lightning to the south made chills dance down Esau’s backbone. “Ain’t nothin’ wrong with me.” Against his better judgment, he let his gaze flicker over to the newly-homeless couple that crouched together beneath a gnarled oak tree. They had been trying to look inconspicuous, no doubt. Unfortunately, the old woman, clutching a thin shawl about her shoulders, had commenced to crying, thus winning Esau’s attention. And Tristan Jones’s. The woman’s husband, hunched from age, chattered in what sounded like German. Maybe the rain will put the fire out before their whole house burns up, Esau caught himself thinking. He corrected the thought quickly. Don’t matter no how. We hate land-grubbing Germans. After all, that was what Tristan said all the time, and he was the leader of this outfit. The German couple stared back at the notorious group of outlaws that had just looted them, burned their house, and left them destitute. Wicked grins twisted the lips of Leonard and Joseph. Tristan slowly drew his pistol from his hip. Esau recognized the terror on the couple’s faces. They were utterly defenseless, left at the mercy of a gang of outlaws, and everyone knew it. He had seen, and heard, that same brand of terror more since joining up with the Covington-Jones boys than any other time in his eighteen years. On the faces of the bank tellers they’d robbed. In the watery eyes and trembling hands of the stagecoach passengers they’d held up. In the cracking voice of that rancher’s daughter who Leonard insisting having his way with before taking the very horses they rode now. Me and Ella. That old couple could just as easy have been me and Ella. The memory of Ella Allen’s soft hair, the color of sunlight, pushed to the forefront of his brooding mind. He remembered the way it had shone despite the rain, falling in waves about her shoulders, that Sunday morning he’d left Paisley Settlement. It had only been a month, but clearly defined in his mind was the way Ella’s grin had slowly melted as she stood in the green field beside the church in their hometown. A fat drop of rain plunked on his hat, causing the sweet memory of his Ella to fizzle into the night. It was probably better. That precious memory had no place here in his new life, anyhow. Best put the memory of Ella, the bright white church on the hill, and everything from Paisley Settlement away forever. Especially the memory of the fire.